He grew ever-more despairing of the complexities of computing systems, which led him to his life's key work, Project Oberon. Oberon was all about a close link between the programming language, the compiler and the computer. Wirth wanted it to be simple, to be readily understood by those involved with it. In 1995 he published a statement which has come to be known as Wirth's Law, an important corollary to Moore's Law, the one about computing power doubling every 18 months. Wirth's Law states that software is getting slower more rapidly than hardware is becoming faster. We are all aware of what is commonly known as "bloatware": software getting more complex for probably no better reason than we expect a new version every year. I am writing this in Microsoft Word, as you would expect. At the top of the screen there are nine top level menu items, containing a total of 128 choices, about half of which have sub-menus or dialogue boxes. Add to that the ranks of buttons at the top of the window. To complete this piece I will use barely a handful: new document; select a style for the heading (which automatically selects normal for the rest of the piece); copy (from other references) and paste; delete; save. All the other stuff is just sitting there taking up processor cycles, waiting for a more adventurous user. Wirth argued that "people are increasingly misinterpreting complexity as sophistication¦ these details are cute but not essential, and they have a hidden cost". He talked of "customers' ignorance of features that are essential versus nice to have". This is the first piece I have written since returning from this year's NAB. This year's excursion to the desert seems a particularly apt time to recall Wirth and his desire for simplicity, because we are currently running dangerously close to misinterpreting complexity for sophistication. Let me emphasise that there was a huge amount of good news. SMPTE has achieved FCD status for a really important group of standards: ST2110, on connectivity over IP for audio, video and control. FCD is final committee draft, which means that the technology is done and the only changes are likely to be the odd moved comma. 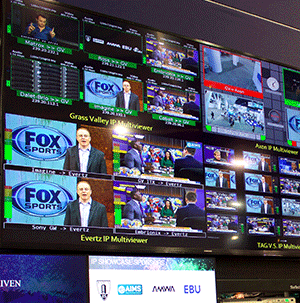 Following on from the remarkable presentation at IBC, there was another interoperability zone at NAB, with monitors showing content passing seamlessly between applications from different vendors. Because of the speedy work on the standard, many vendors have promised ST2110 products before the end of the year. But the feeling I came away with was that the hard work is just beginning. We can move realtime signals around a best-of-breed software-defined architecture, and that is terrific. To get from this science project to a real-world system is going to take more big steps, though. First, and most obviously vital, is security. Thomas Edwards of Fox cropped up in several conference sessions I attended, and he clearly has an excellent handle on the real issues in IP. "No-one has ever been hacked over SDI," he said. "Security always has to be the top priority. But that might be in conflict with business requirements like flexibility and scalability." So we have to be extremely controlled over what connects to what. Current thinking is that every packet on the network has to be authorised, which imposes a real processing overhead, potentially limiting progress. That leads to my second concern. As Brad Gilmer of AMWA so eloquently put it, "how are we going to do all this processing without roasting a chicken?" Just throwing ever more processors at a task not only kills our green credentials, it eliminates one of the supposed benefits of software-defined architectures which is that we get away from vast rooms full of air-conditioned hardware. Ramki Sankaranarayanan, CEO of Prime Focus Technologies, said at the IABM breakfast meeting "remodelling your processes will only get you so far. You have to look at business transformation." Whether in your building or in the cloud, that depends on virtualisation: integrated systems tuned so that the minimum number of processors are working with the maximum utilisation. That, in turn, means that interoperability has to be much more than IP streams flowing with PTP timing. It means that all the functionality has to work from the same user interface, or at least all the user interfaces should have an identical look and feel, tuned to the task in hand. Users, wherever they are in the content chain, should be able to walk up to the equipment and do what they need to do. Ideally it should be so intuitive that most can have zero hours training. Certainly, the user experience must be simple and focused entirely on outcomes. For, as Niklaus Wirth once said, "our heads are no longer capable of processing everything".